Welcoming guests this holiday season will go beyond having some sweet treats baking in the oven and extra towels pulled out of the linen closet. Whether you have a spacious guest suite or a simple extra bedroom for guests we have a few key pieces that make a guest room ready. 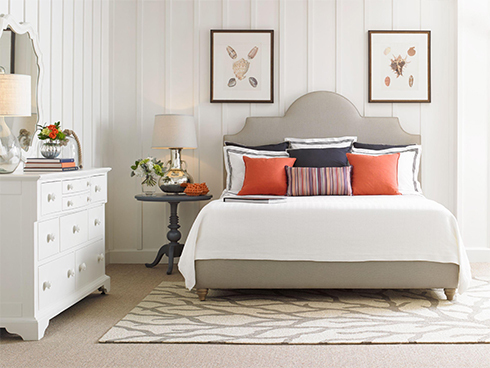 Our design tips for guest rooms can help you create a serene escape for visitors, no matter the occasion! Think neutral hues reminiscent of sand at the beach or cool blues that remind you of the skies. These soft colors help create a calm atmosphere that’s welcoming for guests. For nighttime routines with books, ipads, or magazines, you’ll want to make sure you have a bedside table. A guest room isn’t used often, so this is the room to use your creativity! Don’t feel restricted by nightstands, if you fall in love with an end table or lamp table and the height is right, try it next to your guest bed! Just make sure you have some good lighting with a table lamp or a wall sconce for bookworms! If space allows, add a writing desk for some work space. Your guests may need to get some work done on a laptop, enjoy writing a letter or handwritten note, or prefer to read and enjoy their coffee in their own room in the mornings. These activities require surface space and a simple writing desk easily fulfills this job! Adding something as simple as a side chair to a guest room provides yet another surface that your guests will use! Whether they place their purse down, their outfit for the next day, or use it help put on those lovely shoes it's a functional piece that won't disappoint. Plus, when you stop in to visit and chat, you'll be thankful there's a place for you to sit! Your guest room should be cozy, comfortable, and appealing, and that includes your floor! Don't forget to add a rug. Depending upon your existing flooring a rug can soften a room or add a texture that's comfortable for your feet. Rugs are also the perfect opportunity to add some color or tie together a room's decor. For more guest bedroom design ideas and inspiration, visit Belfort Furniture! Conveniently located in Dulles, Virginia, Belfort Park is home to over 100,000 square feet of showroom space, spread throughout four unique buildings. Need some additional Design Help? Complete our simple online Design Help Form to tell us about your room or project and we'll respond with some great design ideas customized for you!